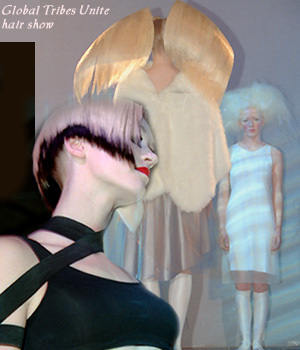 April 1, 2001 - Toronto - This year’s 7th annual Canadian Hairdresser & BeautyBeat Imagine Awards and Global Tribes Unite ceremony, held at the Sheraton Centre in Toronto, brought together hundreds of Canadian beauty industry professionals who cultivate creativity to celebrate it. The event was a reflection of how exciting and thriving this industry really is. Canadian stylists won more than half of this year’s North American Hairstyling Awards primary design categories, even though they accounted for only 30% of the entries. What gives Canadian hairstylists their edge is a culturally enriched creative attitude in conjunction with a Herculean work ethic. Incredible resources, such as Canadian Hairdresser and BeautyBeat magazines, act as a rejuvenating support system. This year’s gala reflected that spirit with a tribal beat runway showcase of incredible hair creations, featuring themes of French and Native Canadian fashion, as well as Icelandic, African, Scottish, Indian and Futuristic. The variety of styles presented was truly amazing. Some of the showstoppers included a razor-cut blonde do with black edge by Fritz Laboucane and John Beeson for Pour Vidal Sassoon, a hair-weaved mask by Pure Salon Artistic Team, a hair umbrella African theme by Salon Daniel, and hair wings Ã la Iceland by Civello Creative Team, just to mention a few. The inspiring and upbeat gala was followed by suspenseful moments, as everyone held their breath for the Awards 2001 finalists. Pure Salon from Montreal walked away with an incredible four out of 18 awards presented, including the Hairdresser of the Year award that went to Anna Pacitto-Merlo. Pure Salonâ€™s amazing team has been garnering accolaides across the continent. Pureâ€™s Leo Forsythe is a two-time winner of the North American Hairstylist of the Year Award. Congratulations to all the winners and to Harco Publishing for putting this event together. Photographs of award winners courtesy of Harco Publishing.